Betty Sadie Myrtilla McEachern Bahr, age 92, of Nampa, Idaho, passed away at home on February 3, 2019 after a prolonged battle with dementia. The memorial service will be held at 11:00 AM, February 22, 2019 at the Nampa Seventh-day Adventist Church. Pastor Chris Evenson will be officiating. Burial will follow the memorial service at the Idaho State Veterans Cemetery. Funeral arrangements are being handled by Alsip and Persons Funeral Chapel. Betty was born in Glendale, California on May 28, 1926. She graduated from La Sierra Academy and continued on to receive a Nursing degree from the College of Medical Evangelists, now Loma Linda University, in 1949. 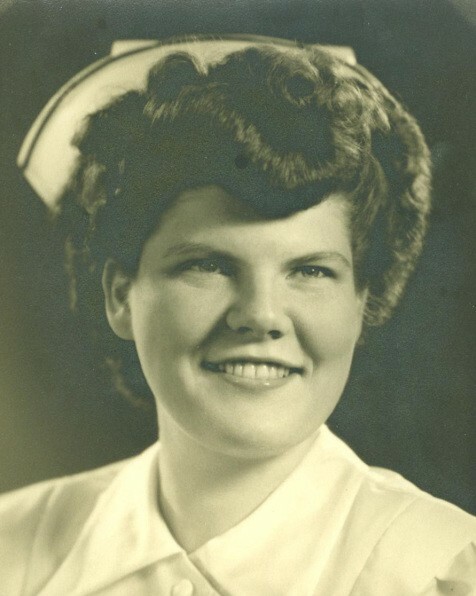 After working at Loma Linda Sanitarium and Hospital for two years, she attended Pacific Union College for a year, graduating June 1, 1952 with a Bachelor of Nursing Education (BSNE) degree. She earned a Masters in Public Health (MPH) from Loma Linda University extension school in 1982. Betty was married at the Loma Linda Hill Church to Karl H Bahr on June 3, 1952; they were married more than 64 years. Betty worked as a nurse in many different settings for most of her adult life. She enjoyed writing, music, and being of service to others. She was also actively involved in her church, in ASDAN (Association of Seventh-day Adventist Nurses), Council for the Elderly in Frederick, MD, Sligo Music Club, sang in NACS (National Adventist Choral Society) directed by Francisco de Araujo, and in retirement volunteered in a variety of positions associated with Park Ridge Hospital. Betty is survived by her children Karyl Krieger, Fredrick Bahr, and Edward Bahr; grandchildren Erika Combs, Allison Mason, Dustin Bahr, and Ashley Bahr; great-grandchildren Natalie Combs and Maxwell Bahr; and other family and friends. Betty is preceded in death by her husband Karl H Bahr; her parents John H and Myrtle McEachern, brother Kenneth MacEachern, sisters Margaret Flavel Cates and Halcyon Ione Pinney, niece Marilyn Pinney Campbell, and nephew John Pinney. In lieu of flowers, donations can be made to Betty Bahr's Loma Linda nursing alma mater. Select "School of Nursing" then "Other" as needed and finally type in "Maureen Maxwell/Dorothy Martin Graduate Nursing Scholarship"